10/07/18. NO FEE. NO REPRO FEE. JULIEN BEHAL PHOTOGRAPHY. Picture shows, H.R.H. The Duchess of Sussex at the Garden Party in Glencairn, the British Ambassador’s Residence . JULIEN BEHAL PHOTOGRAPHY. NO FEE. 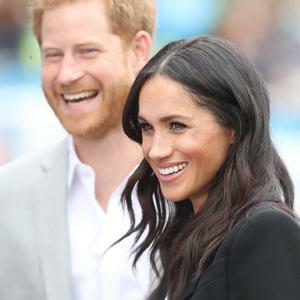 Her big day beauty look has become the inspiration for many brides hoping to show off their best features au natural on their wedding day, and Meghan Markle has only continued to provide ideas for sleek, chic bridal beauty on her most recent trip to Dublin. The Duchess has enjoyed several costume changes since touching down on the Emerald Isle - including a picture-perfect forest green Givenchy high-waisted pencil skirt and round-neck top as she stepped off the couple's private jet at Dublin airport, and a black Emilia Wickstead number that was equal party elegant and flirty for a garden party at the British Ambassador's residence - but there's one thing she's not changed since she said 'I do' weeks ago, and that's her natural glow. Meghan's beaming smile and shimmering skin is her signature, and she needs the perfect hair do to show it off at its best - much like most brides would like on their wedding day. And those looking for some gorgeous ideas for their 'dos are sure to find some in the Duchess' ever-changing styles on her recent trip to Dublin! Part of Meghan and Harry's 11 person entourage is celebrity hair stylist George Northwood, who styled the Duchess' hair for the evening reception at the wedding in May. According to reports, Meghan has privately paid for the stylist to be by her side on her Dublin visit - and judging from her lack of flyaways it's money well spent! 10/07/18. NO FEE. NO REPRO FEE. JULIEN BEHAL PHOTOGRAPHY. Picture shows, the arrival of H.R.H. The Duchess of Sussex to Glencairn, the British Ambassador’s Residence. JULIEN BEHAL PHOTOGRAPHY. NO FEE. How many times have we asked for this look (or tried to do it with the GHD ourselves), only to come out looking like Farrah Fawcett after a particularly vicious fight scene? Meghan's subtle tousled tresses are sure to provide inspiration for a bounty of brides looking for a little twist on loose hair for the big day. Proving you don't have to spend hours in the chair to look as elegant as it gets, Meghan's low bun, worn on the couple's quick visit to the Aras was a lesson in 'less is more'. The modern look minimal low bun complemented her boatneck asymmetrical Roland Mouret taupe dress perfectly - showing off her decollage and pretty earrings to perfection! By far our favourite hairstyle of the visit so far, Meghan looked completely chilled with wavy locks on the couple's visit to Croke Park. It was very much business downstairs when it came to the slick black suit and heels, but the casual soft dropped curls and middle parting gave her look a fabulously feminine feel. #Goals if ever there was any. 10/07/18. NO FEE. NO REPRO FEE. JULIEN BEHAL PHOTOGRAPHY. Picture shows, the arrival of H.R.H. The Duke of Sussex and H.R.H. The Duchess of Sussex to Glencairn, the British Ambassador’s Residence. JULIEN BEHAL PHOTOGRAPHY. NO FEE. 10/07/18. NO FEE. NO REPRO FEE. JULIEN BEHAL PHOTOGRAPHY. Picture shows, H.R.H. The Duke of Sussex and H.R.H. The Duchess of Sussex at the Garden Party in Glencairn, the British Ambassador’s Residence . JULIEN BEHAL PHOTOGRAPHY. NO FEE.